"A real Aladdins cave" is a comment we hear frequently about our store. We come across some fabulous pieces..which dont last long! Keep coming back to check this category as we will update regularly with new and exciting items! What a piece this is! Just under 5.0 meters long and 970 wide. Stunning Rustic look. 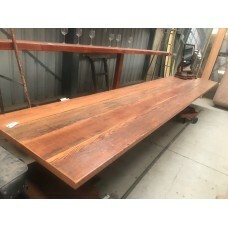 Reclaimed Solid Timber Farmhouse/Boardroom/Dining Table. ..